Ronald Smith has made the presentation of Alkan's piano music a large part of his life's work. 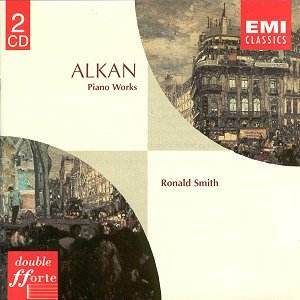 Smith's adventures among the Alkan legacy seem to have been part of my classical music background dating well back to the late 1960s. It is a delight that he has recorded so much of this composer's music and that EMI have now lovingly transferred more than two and half hours of his tapes to CD. There is no special mystery to Alkan. The way he is sometimes portrayed one would think that one had to be initiated into the mysteries before one could hope to appreciate his music. In fact it is approachable by anyone who can take a style that inhabits a world between Beethoven (Waldstein, Appassionata, Moonlight), Chopin (Waltzes and the sonatas) and Liszt (Gnomenreigen and the Sonata). Smith's touch and his feeling for colour is phenomenal. The Op. 33 Sonata is in four movements each exploring the essence of life's decades. The fact that it never reaches the sixties is a comment on the expectation of longevity in the 1850s. Vingt ans is haltingly imaginative touched with bel canto (3.12). Trente ans - quasi Faust is instinct with explosive drama (1.13) which contrasts with the pacific Quarante ans - Un heureux ménage. The finale Cinquante ans - Prométhée enchâiné comprises a hesitant questing and finally a dramatic gesture undermined by a mournful philosophical resignation. The Four Etudes from Op. 39 include a volplaning Mendelssohnian race, an essay in stern nobility, an irate and bass heavy imprecation and a playfully accented dance rather like Three Blind Mice roughly chopped. La Chanson de la Folle au bord de la mer is remarkably imaginative and I owe it to Gordon Rumson for introducing me to this extraordinary piece. The Allegro barbaro is a pretty amazing approach to Shostakovich in its pugnacious jaw-set. It is worth recalling that Smith recorded a memorable studio performance of the Shostakovich Second Piano Concerto in 1979. This was a BBC event with the Concert Orchestra conducted by Norman Del Mar. A striking antidote to sentimentality. The first and third movements of the Op. 61 Sonatine are stylistically similar to Saint-Saëns with whirling Cossack interludes and Chopin-like waltz episodes along the way. The very strange second movement suggests powdered wigs and has a stately 'olde worlde' English Warlockian feeling. The finale hints at the sort of brusque whirl we associate with Bartók in his village dances. This is crossed with and zither evocations as harmonic pepper. The Trois Grandes Etudes have a grandeur redolent of the Granados's Goyescas and then Handelian arpeggiation finishing with mephisto velocity. The first Etude is for left-hand only; the second for the right-hand and the third mouvement semblable et perpétuel, for both hands. Finally come the Etudes de Bravoure with their Beethovenian musculature and Russian prestissimo.